TBS Penang Terminal Bersepadu Selatan (TBS) Main Counter A/B/CD/E/F/GH Kaunter 22, Terminal Bas Ekspres, Jalan Sultan Azlan Shah, 11900 Bayan Lepas, Pulau Pinang. TBS Penang - Please note that there will be additional RM1 surcharge per ticket. - Please PRINT THE CONFIRMATION EMAIL for boarding. - For any other inquiry, passenger can approach the counter to request, subjected to approval. For general inquiry on booking via busonlineticket, please email to sales@busonlineticket.com Terminal Bersepadu Selatan (TBS) Main Counter A/B/CD/E/F/GH Kaunter 22, Terminal Bas Ekspres, Jalan Sultan Azlan Shah, 11900 Bayan Lepas, Pulau Pinang. Bus from KL to Penang is one of the most popular bus routes in Malaysia. The bus service is not only for locals but also for tourists because thousands of tourist travelling between the two cities for their holiday. The bus fare for standard VIP bus from KL to Penang is ranging from RM 38.00 to RM 42.00. Konsortium is one of the favorite choices among the locals. Some coaches provided by Nice, offering personal TV and meal on-board, charge higher price at RM 74.00. Nice Imperial, another brand new type of Nice coach, offers not just personal TV and meal on-board, but also Wifi onboard. Price of Nice Imperial is even higher at RM 103.00. However, to business traveller, Wifi, Meal and personal TV on-board are convenient service to them, which justifies the higher fare. Other than Nice Imperial, Alisan Golden Coach Express also provides Wifi on-board. That is the reason why Alisan Golden Coach bus fare is slightly higher than the others, at RM 42.00. Please note that bus fare will increase during festive period of Chinese New Year and Hari Raya Haji. Duration for bus from KL to Penang usually takes about 4.5 hours, depending on traffic condition. Coaches depart mainly from TBS (Terminal Bersepadu Selatan), with the exception of Transnasional, Plusliner and Nice departing from KTM Old Railway Station Kuala Lumpur. 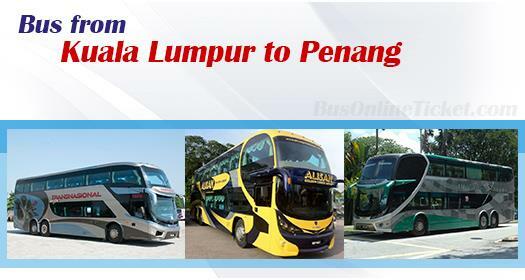 Taking bus from KL to Penang is convenient, economical and comfortable. Now it is even more convenient by booking bus ticket online at BusOnlineTicket.com with instant confirmation. Credit card payment and internet banking options are available for online payment. Now BusOnlineTicket.com goes further ahead by providing 7-11 store cash payment after reservation in BusOnlineTicket portal. Passenger can go any 7-11 store in Klang valley to make cash payment when booking your KL to Penang Bus Ticket.